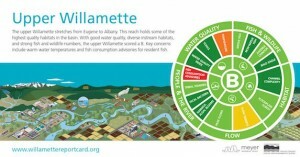 The Willamette River Report Card gives the river an overall passing grade of B- and section grades of B for the upper Willamette (Eugene to Albany), B for the middle Willamette (Albany to Newberg), and C for the lower Willamette (Newberg to the Columbia River). Here in Corvallis we are part of the Upper Willamette with an overall score of B. The report card was created to establish a baseline for Willamette River health by which progress could be measured in the future and to explain how community actions and individual choices impact river health. Tens of thousands of people visit the Willamette every year to swim, boat, fish and play, and the Willamette Valley is home to two-thirds of the state’s population. Farmland, cities and our thriving wine and beer industry all rely on the Willamette and its tributaries. And we’re not the only ones who need and use the river—bald eagles, beavers, turtles, salmon and many other animals rely on the river for their survival. The health of the Willamette River first came to public attention 50 years ago, when cities and factories were dumping untreated waste and industrial pollution into the river. In the 1960s, former Governor Tom McCall championed a series of initiatives to clean up the Willamette River from municipal and industrial pollution. Today, that work continues with locally-based watershed councils, land trusts, SWCDs and other organizations like Marys River Watershed Council along the Willamette that improve the rivers and streams in their communities. Here in Corvallis, MRWC collaborates directly with generous landowners, students and volunteers to take on big projects for big returns found in cleaner, cooler water and improved habitat for wildlife. We invite you to join us in that effort and in making the river an even safer, cleaner place. Volunteer with us, and encourage your family, friends and neighbors to join us. You can also lessen your impact on the Willamette River with a few simple behaviors, including reducing the amount of chemicals used at home, choosing non-toxic lawn and garden care products, disposing of hazardous products properly, planting gardens to capture rainwater, and ensuring that pet waste is picked up and thrown away. Thank you for making the Marys River better for everyone!